* Different ways to view your calendar – Quickly switch between month, week and day view. * Events from Gmail – Flight, hotel, concert, restaurant reservations and more are added to your calendar automatically. * To-dos – Use Reminders to create and view to-dos alongside your events. * Goals – Add personal goals—like “run 3 times a week”—and Calendar will schedule time for them automatically. * Quick event creation – Smart suggestions for event titles, places and people save you time when creating events. 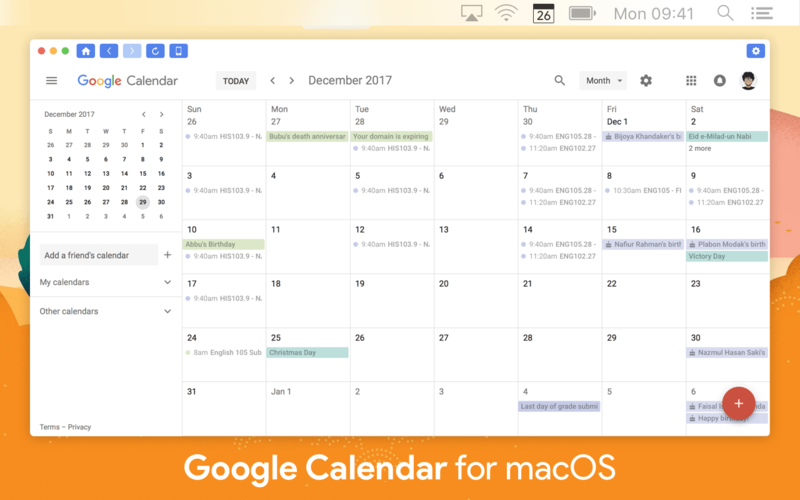 * All your calendars in one place – Google Calendar works with all calendars on your Mac, including Exchange.